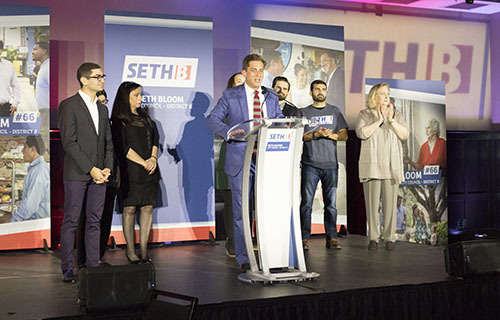 After a recount concluded Monday morning narrowing the margin of his loss to 128 votes, Seth Bloom has conceded the District B election to Jay H. Banks, he announced Monday afternoon. “This was a hard-fought race and obviously very close. Our volunteers and supporters never gave up, working tirelessly to the very last hour on election day. With a switch of only 66 votes changing the outcome, I felt an obligation to my supporters and the voters of District B to make sure the process was fair and accurate. I also ran on a platform of transparency and accountability, so we wanted to make sure the process was handled appropriately by the officials responsible. In our review and analysis of the election results we uncovered that there were a significant number of discrepancies and irregularities. We owe it to the citizens of New Orleans to make changes to increase transparency and voter confidence in the election process. For instance, to at least avoid the appearance of a conflict there should be a review of the policies of the Board of Election Supervisors. Individuals should not arbitrate the outcome of an election involving a candidate they have publicly supported. The rules which prohibit judges from participating in politics would seem more appropriate. A total of 36 people were able to vote without signing the voter registry upon arriving at the precinct, which is required by law. This happened at 15 different precincts, but was most severe at Ward 11 Precinct 14, where 16 more people voted than signing the registry. Nine people’s votes were not recorded at a variety of precincts, meaning that one fewer vote was tallied by the machines than people who signed in. Election commissioners “failed to certify” the number of voters in three different precincts.